Ahem, yes. This is for "Your fave Zankupato" contest, on TheOtaku. It's also a reference to the first dance, Tsukishiro (Lit: White Moon) of the Zankupato form. 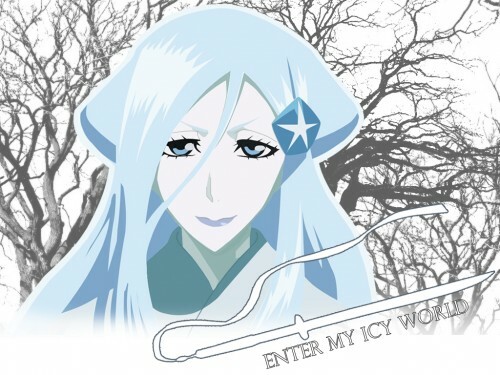 Tsukishiro reaches up to the heavens, and freezes anything within the circle; thus the concept of "Enter my icy world"
The character vector is pretty good, but the edges of the sword are very messy, and don't fit with the smoothness of the girl. The trees in the bg look awfully rough in comparison, too. Softer trees, and maybe a more detailed sky behind them would definitly add depth to the wall. I'm impressed by your description, it's obvious you put a lot of thought into this. Good work. thx for sharing it anyway..
:O sode no shirayuki x3 so cute!